The first ever 'UFO Crash' Mob party was held in Olde Burien, WA this past Monday on April Fool's Day. A street was closed off to accommodate 300 people dressed in alien themed garb. 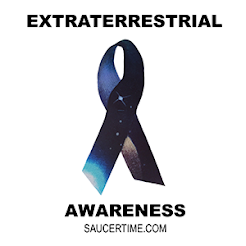 Attendees enjoyed live music, flash mob dancing, a costume contest, a photo booth, what appears to be a smoking UFO and much more! 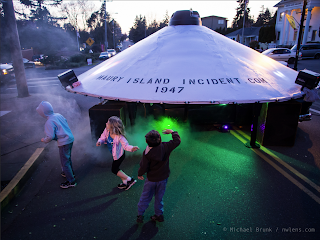 The celebration was to help promote the upcoming production of the short film 'The Maury Island Incident". The film will be based on the nearby, historic 1947 UFO sighting. Production will began locally in June. What do you think? Would you participate in a UFO crash mob party?